Duncan Johnson’s works on display at the Marcia Wood Gallery put me in that certain mood when walking out into the woods, for no other reason than to be among plants and animals, and noticing that I hope to find some treasure there, some little lost cache of jewels, or a gold coin, or a letter from Walt Whitman. All of the things in the woods are jewels in themselves–if you know something about them. When it comes to gold coins, though, you don’t have to know anything. It’s gold and you’ve hit paydirt. 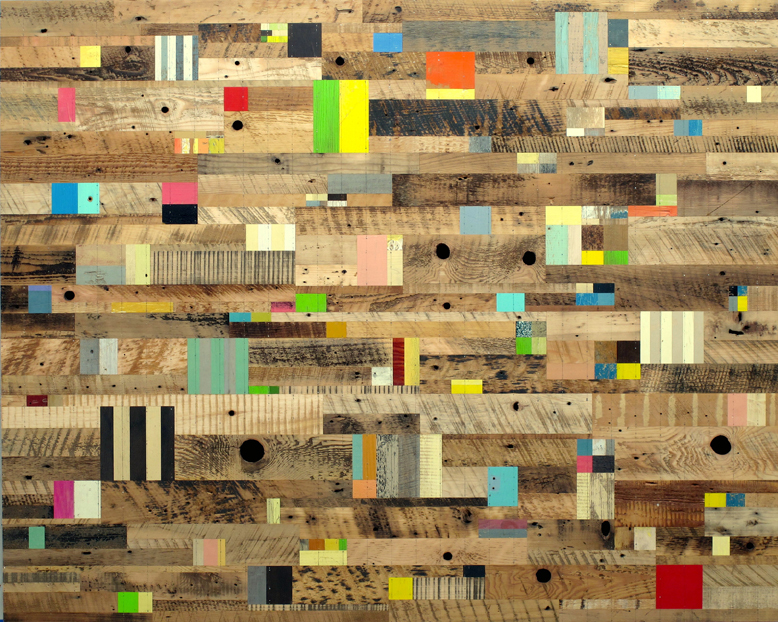 Johnson’s works are composed of wood that he has reclaimed, not from the woods, but from landfills and construction sites. 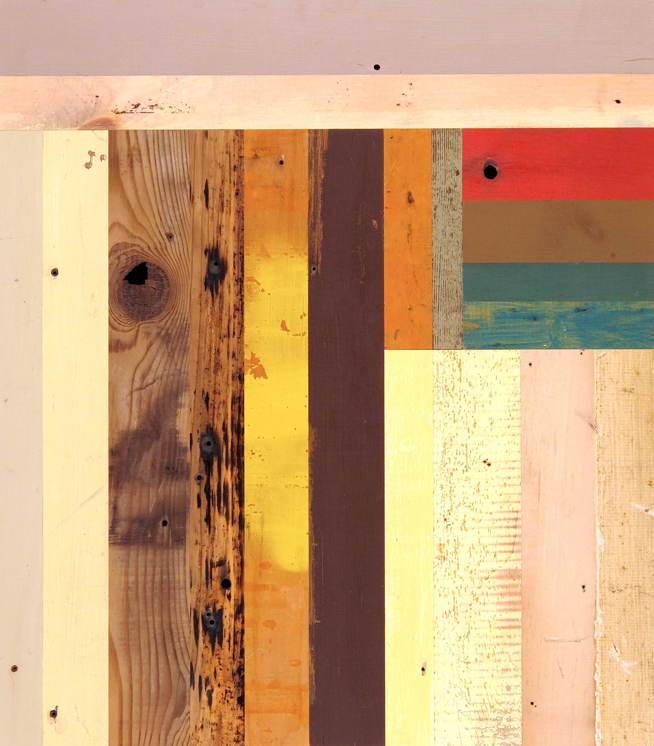 He forms the found wood into rectangular strips and assembles them into flat collages. He adds straight pencil lines and nails. If you look at photographs of the works, they look like patchworks of varying rectangles that either have painted surfaces or the natural wood surface. At first they seem impenetrable, like a color field. The opportunity for play comes when you look at the work in person and see the variations in grain patterns, the paint in its varying styles and states of decay, the natural wood punctuated by knot holes and nail holes and perhaps gunshot holes. Portions of the works, with their colorful stripes, sometimes resemble flags. The wood that provides the material for these pieces is of course three-dimensional, but Johnson has made these pieces flat like paintings. On the other hand, the pieces are three-dimensional in one important way: beneath the knot holes and nail holes the viewer sees the darkness of space rather than the material to which the wood strips are attached. As I wandered visually among the knot holes and bullet holes, the faded colors, the flecking, I imagined I could peer into those holes and see something behind or under the surfaces. What would I see? Surely it would be some of my fellow human beings, having some sort of drama, or making something. What is also present that is not manmade is the wear and tear of time that is visible on these flat surfaces. What time does, what time works upon objects, is intensely present in the beautiful breaking down of old maroons and yellows, the tiny bloating of ambient moisture in natural wood, and the holes that form where the wood is weak. I am glad I wandered into the woods and discovered Duncan Johnson’s work. It has the capacity to suggest both an exploration of the manmade and also an exploration of what is not. 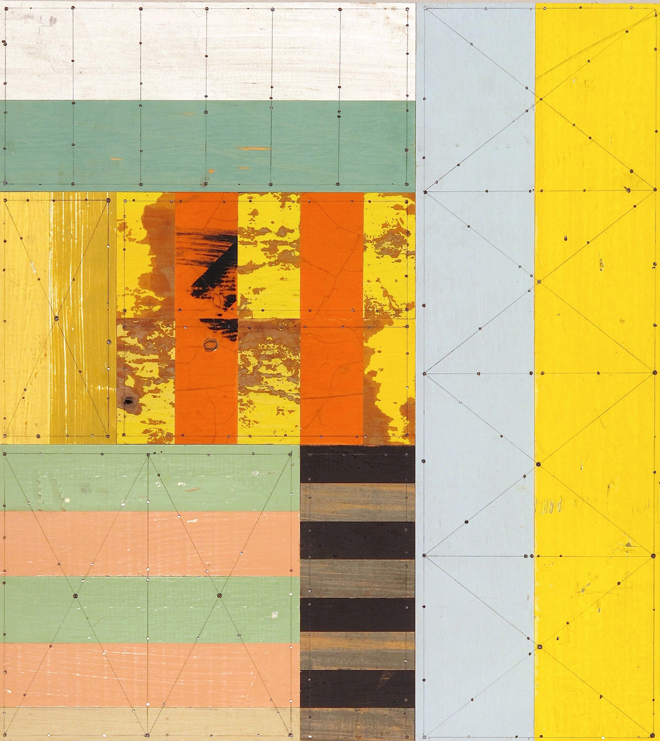 Duncan Johnson’s work is at Marcia Wood Gallery through May 25, 2013. This entry was posted in Art in Atlanta, Uncategorized and tagged Abstract art, Duncan Johnson, Flatbed picture plane, Jasper Johns, Leo Steinberg, Marcia Wood Gallery, Robert Rauschenberg on April 29, 2013 by Bryan Alexander.